You see this? This is the ENEMY. – begging your friends for stuff items? Check. – flooding your (and others, if you haven’t toggled the settings) feed with meaningless game milestones? Check. – constantly checking back in to see if a particular timer is done, so you can start a new timer? Check. – using real money to buy in-game equipment or perks that ultimately mean nothing? CHECKCHECKCHECK. – unending stream of NEW and LIMITED TIME OFFER products that will greatly improve your game but only available for IRL cash? Check. There is also the added wrinkle of a PvP option that’s just about as unbalanced, broken and completely maddening as you could want. People like to talk about fighting games having balance issues and I know that many of them do, but eventually they get patched, maybe a certain character gets nerfed, and we all move on. But imagine if, any time you played Street Fighter IV and no matter which character you chose or how you played, if your opponent was using Ryu you’d lose. Pretty soon, everyone would be using Ryu and the game would get boring & stale. 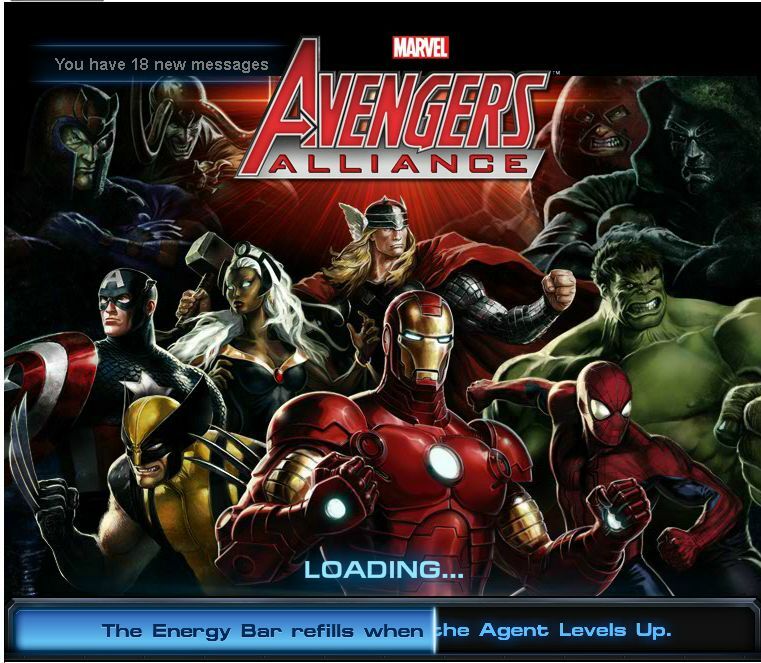 That’s what the PvP in Avengers Alliance is like. Except instead of Ryu, it’s the detestable Scarlet Witch. Her “Hex Spheres” may be the the worst thing to happen to video games since the invention of the water level. So not only is there a fundamentally unbalanced character that completely dominates any PvP match she participates in, there’s also the added “bonus” of playing against people who juice their stats via, again, real cash. This means the ONLY way to compete with these people is by paying, turning this free game into a cash arms race. And if you don’t want to go that route, PvP is unplayable. You get one-shotted to death and if by some miracle you do get a turn to attack? You do either negligible damage or miss entirely. Like I said FUN. So what’s the appeal, if the game is just a hole you throw money in to? Well…it’s FarmVille or MafiaWars for comic book fans. That’s the simplest yet most complete explanation I can come up with. It’s got the leveling/grinding aspect, it’s got the random chance for l33t gear, it’s got customization of iconic super heroes, it’s even got the materia socketing from Final Fantasy VII!! All very powerful motivators that, despite my deep reservations, keep me coming back. Look what else is going on: four “payment” materials to collect (command points, S.H.I.E.L.D. points, gold & silver) all of which are necessary to advance, experience to gain, research to complete (to improve oot drops and buyable gear), heroes to train (more powers & more chance to socket materia Iso-8), flight missions to complete (earn cash). It’s a busy, busy game. One “turn” which consist of battling villains and their henchman, can take anywhere from 15 minutes to an hour. There is a governor on the number of turns you can have in a day and that is the limited amount of energy the game gives you. You have 60 points of energy at any one time; every encounter win or lose takes 10 points away. So barring using external energy or leveling up which will replenish your energy, you can fight 6 times before you have to wait for your energy to refill. Through some creativity, you can complete maybe 3 full “turns” a day. That’s 3 hours a day just click-fighting endless hordes of Hydra, A.I.M. and Hand goons on your way to the occasional super villain. Tack some more time on there for character management & long-range planning and you can easily see how this game can quickly absorb your time. RAGE CORNER: I really enjoy when you click on an enemy to attack them and whoops, it just skips your turn. Or after a grueling boss battle where you use up rare items you’ve obtained with all your grinding, the game schtizes out, says there’s a “combat synchronization error” and you have to redo the entire boss battle, MINUS the energy and items you spent. Great. All of your character attacks have been doing 400+ points of damage a turn? And you really need to kill a particular enemy with >400 HP this turn? Then it makes sense that your attack would do just enough to leave the enemy with 1 HP, allowing them to kill you. Playdom (more like Play, DUMB aimirite), the company that pooped out this addiction perversion, doesn’t even have customer support! Rather, when you ask them a question and they answer “Sorry we do everything through a third-party vendor you should try and contact them HAHA LATERZ B!TCH!!1!”. ← “Eliminating Spirits Makes One Feel Invigorated”: Steampunk Ghostbusters!